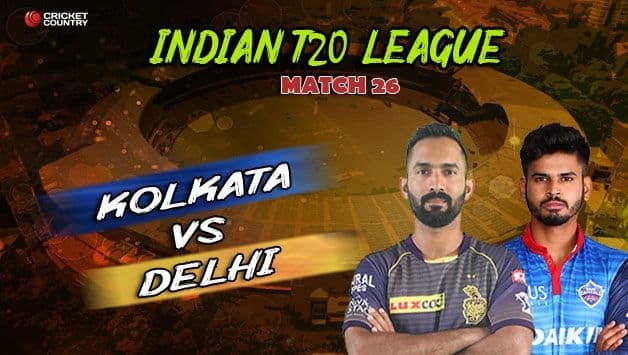 All the latest updates, coverage and much more from Match 26 at the Eden Gardens where Kolkata Knight Riders (KKR) host Delhi Capitals (DC). Bruised after their defeat to Chennai Super Kings (CSK) in their previous match, Kolkata Knight Riders (KKR) are looking to return to winning ways. 11.51 pm: That’s a wrap, folks. Do stick around for all the post-match reports, analysis, videos and much more. Hope this match was a fitting end to your week. Till then, from all of us, it’s goodnight! Summary: What a clinical performance by Delhi Capitals. Everything went just according to plan, their bowlers did the job to restrict the opposition. And when it came to the run-chase, their batsmen went out all guns blazing. Delhi Capitals move up to fourth place with their win over KKR. 19th over: Chawla to continue and Colin Ingram has finished off things in style, smashes a boundary and a SIX on the fifth ball to seal the victory as Delhi Capitals thrash Kolkata Knight Riders by 7 wickets. Meanwhile, here’s an observation from the Indian women’s head coach WV Raman. 20th over: THAT’S IT! Keemo Paul’s final over goes for 10 runs and the wicket of Carlos Brathwaite, who scored 6. KKR finish at 178/7. #KKRvDC, @DelhiCapitals missed a trick not bringing on @KagisoRabada25 early to @Russell12A. Need to get him early not allow him time at the crease to settle. Dinesh Karthik: Last game was a bit of an aberration. We didn’t expect it would play like that. We have got three changes. Lockie Ferguson, Joe Denly and Carlos Brathwaite come in. Narine, Gurney, Lynn miss out. Shreyas Iyer: We are gonna bowl first. The wicket looks a belter, it’s going to be a flat track. We have been chasing well in the last few games, hence positive about that. Keemo Paul comes in place of Lamichhane. 7.32 pm: TOSS: Shreyas Iyer wins toss and Delhi Capitals have elected to bowl. 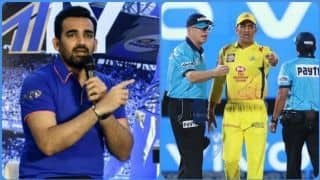 7.28 pm: PITCH REPORT: “This is probably one of the smallest grounds in IPL 2019. Nine runs an over is the average score on this pitch this season. The seamers can bowl around the good length area to make the most out of the conditions. It’s a well grassed track, hence there shouldn’t be much spin on offer. A good chasing ground,” says Ian Bishop. 7.17 pm: Important announcement from the weather man, contrary to the forecast, there’s NO RAIN today. 7.12 pm: Players have arrived at the Eden Gardens. It's going to be Match 26 of the #VIVOIPL wherein the @KKRiders are all set to take on the @DelhiCapitals. 6.55 pm: One of the key battles to look at in this mouth-watering encounter will be between Dre Russ, that’s right, Andre Russell and KG, Kagiso Rabada. What else to expect? Here’s all the dope. 6.52 pm: How excited are you for this one? Another Super Over at the Gardens too, or will that be too much. We’re building up to this one, hoping to be the perfect end to the week, should be a Friday blockbuster. That and much more. They met not too long ago and set the stage on fire. But that Super-Over finish involving Delhi Capitals and Kolkata Knight Riders at Feroz Shah Kotla seems to have happened ages ago. Such is the pace of the Indian Premier League. Since that thrilling encounter, both the teams have played three more matches in the league with KKR winning two while DC managed one come ahead in one of their three contests.